Joe Steven Lacob was born on 10 January 1956, in New Bedford, Massachusetts, USA, of Jewish ancestry. Joe is a businessman, perhaps best known for being the majority owner of the National Basketball Association (NBA) team, the Golden State Warriors. Aside from that, he had been a partner at Kleiner Perkins Caufiled & Byers, and already had experience investing in and handling basketball teams. His efforts have led to his current wealth. 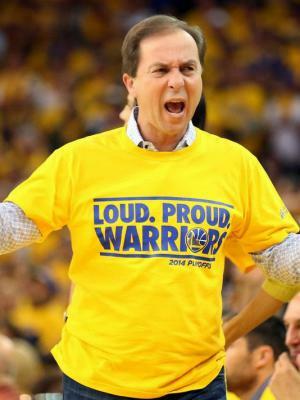 How rich is Joe Lacob? As of early-2016, sources estimate a net worth that is at $400 million, mostly acquired through his success in business. A large part of his net worth is due to the fact that he is the majority owner of the Golden State Warriors, though he owns other enterprises and businesses, all of which increase and maintain his wealth. At a young age Joe was already a fan of the NBA and his favorite team was the Boston Celtics. Eventually their family moved to Los Angeles, where he would also become a fan of the Los Angeles Lakers and the Los Angeles Angels of Anaheim. Lacob would study at the University of California, Irvine (UCI) from where he would graduate with a degree in biological sciences. He then went on to study for a master’s degree in public health from the University of California, Los Angeles (UCLA) before completing his MBA at Stanford Graduate School of Business. For his work, Lacob started out as an executive of Cetus Corporation (or Chiron), and then FHP International and Booz, Allen & Hamilton. Eventually Joe became a partner at Kleiner Perkins which is a venture capital investing firm. He became a partner in 1987 and started to focus on firms that involved internet, energy, medical technology and life sciences. A few of his investments are AutoTrader.com, NuVasive, and Invisalign. Aside from these investments, Joe became a primary investor in the American Basketball League which was the rival of the Women’s National Basketball Association (WNBA). In 2006, he would go back to one of his favorite childhood teams the Celtics, to become co-owner and co-investor. His investment stayed until 2010, when Lacob and a group of investors decided to buy the Golden State Warriors for $450 million, and in order to do so he had to sell his minority interest in the Celtics – Joe became successful in buying the franchise over many bidders. Lacob was subsequently responsible for acquiring David Lee and the undrafted Jeremy Lin, and for firing coach Don Nelson. One of Joe’s most recent moves was firing coach Mark Jackson after back to back playoff appearances – according to Joe, one of the main reasons for the decision was due to the fact that a lot of people in the organization couldn’t work with him. For his personal life, Joe admits to being the first in his family to graduate from college and to rise from rags to riches. He paid for every dollar needed for his education and was responsible for raising his own net worth. Other than that and his enthusiasm for basketball, he is married to Nicole Curran, but keeps the relationship largely private.